Ancient Greece – Argentine developer Coffee Powered Machine and American-British label Devolver Digital are proud to announce that Greek mob dramedy Okhlos is launching this spring on PC, Mac, and Linux. Okhlos will be playable at the upcoming PAX South inside the Devolver Digital booth  and any attendee that demos the game while wearing a toga or tunic will receive the entire Devolver Digital library of games on Steam. Originally written and performed in Athens in 507 B.C. and winner of Best New Dramedy at the 508 B.C. Dionysia Festival, the chaotic Okhlos will have modern gamers stepping into the sandals of ancient Greek philosophers to lead angry mobs of irate citizens and bring down the oppressive god of mythological Greece. Your beloved brothers and sisters will no longer stand for the abuse from the deities. They have taken up arms against them and are hell bent on taking down anything and everything in their path. Topple the beastly minotaur, bring down sacred temples, and confront the almighty Olympians themselves while recruiting and balancing your unruly mob with warriors, peasants, slaves and even livestock in their quest for freedom from Mount Olympus. It’s total anarchy in the birthplace of democracy. 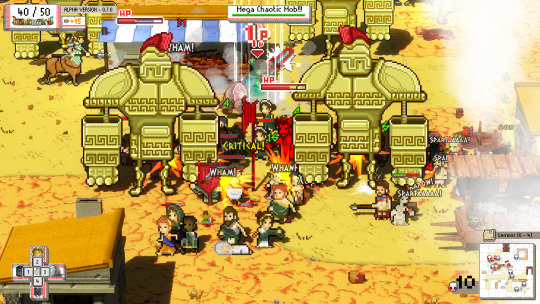 “Okhlos is basically a modern retelling of Homer’s Odyssey but instead of a classical hero embarking on a grand adventure it’s mostly pissed off greeks wrecking stuff until they get their way,” noted Devolver Digital CFO Fork Parker. “Come to think of it Okhlos is nothing like the Odyssey. Whatever, just buy it.” Okhlos fans and toga enthusiasts can follow the angry rage of the people via Twitter @Okhlos and @DevolverDigital or by visiting okhlos.com on their most personal of computers.